Most complex products are both mechanical and electrical, with the balance rapidly increasingly moving towards innovative electrical engineering as new product and service differentiation. Competitive product development requires robust collaboration between multiple domains, including the tight integration of electrical hardware and software development with traditional mechanical design and enterprise processes. These trends reinforce the need for more robust integration between Electronic-CAD (ECAD) and Mechanical-CAD (MCAD). It goes beyond the basic need for ECAD-MCAD data alignment, technology and engineering collaboration (also referred as ‘mechatronics‘). The integration of mechanics and electronics has led to a hybrid discipline known as mechatronics. ECAD is not new and goes back a long way since the introduction of electronics in products in the manufacturing industries. Equally, the transfer of data between ECAD and MCAD communities is not new. However, there has been (and somewhat still is) a major disconnected between the ECAD and MCAD domains, limiting collaboration due to poor data integration strategies and tools. Moreover, during the past three decades, traditional manufacturing industries have focused on mechanical related engineering data and enterprise data, building on early successes of MCAD, Product Data Management (PDM) and other enterprise IT tools. Information models differ between ECAD and MCAD; traditional PDM/PLM data models align by default with exploded MCAD structures. ECAD data is based on file package with multiple ‘black box‘ elements which are not exposed in PLM or do not align with its native data model; this represents a challenge in terms of data traceability at the relevant level of granularity. 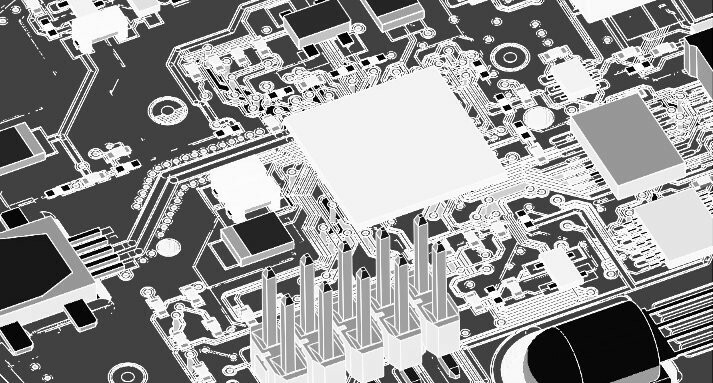 At each phase, the product design requires relevant output documentation for the entire system or subsystem, including 3D Printed Circuit Board (PCB) and rigid-flex elements, including fit, form and function properties, space reservation and clearance information. Traditionally, data exchange mechanism have been defined between ECAD and MCAD to transfer positioning information, material, lengths, space reservation, mechanical properties, weight, cost, supplier information, etc. Even today, there is still the need for a more seamless integration of the electrical and software domains within the entire scope of the Product Lifecycle Management (PLM)platform, beyond multi-CAD, CAE and BOM-CAx data alignment. This translates into a full integration of ECAD and Application Lifecycle Management (ALM) with PLM and the Enterprise Resource Planning (ERP) backbone, enabling real-time update visibility, data associativity tracking, history control, robust data branching and change control across the extended enterprise. This span across the entire New Product Introduction (NPI), from concept planning to maintenance and service. Visualise and identify issues within an integrated 3D platform hub, with a view to fix them at source where the related data is mastered. 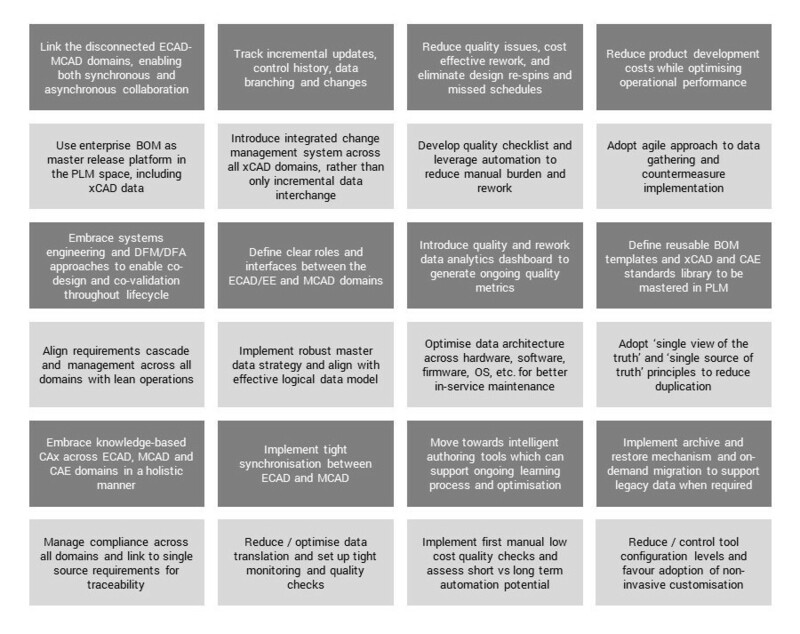 Move away from incremental change to integrated change management and simultaneous engineering across ECAD and MCAD environments. Continuously synchronise results between ECAD and MCAD to avoid costly re-spins due to mismatch in design data, and trace the decision process throughout the entire design process; with a view to shorten iteration cycles between mechanical and electrical product development processes. Implement a combination of on-demand user-driven and automated system-driven data alignment mechanisms, via synchronous and asynchronous communication protocols using transaction-based enterprise interfaces. In addition to the ECAD question, there is also a key question about the role of ALM vs PLM, should they complement each other, should they be kept separately, should they be harmonised or integrated as they serve different purposes (…). This post was originally published on LinkedIn on 15 November 2016.